the four main food groups: candy, candy canes, candy corns, and syrup. Nooooooo! But my Uncle Stanley used to amuse me and my brother by telling us he was going to make soup with soda as broth and candy as meat and vegetables. Luckily he never made it a reality. Now that I think about it, a little of this might not be bad because of the spaghetti. A lot of chocolate icebox pies in the South have crusts without sugar, and that keeps them from being too sweet. There are plenty of places where you can get pancakes topped pretty much like Buddy does the spaghetti. I don't see why spaghetti instead of gluey diner pancakes would be any worse. On the other hand, those photos make it look lazy and bad and they should feel bad about serving it. Now that I think about it, a little of this might not be bad because of the spaghetti. 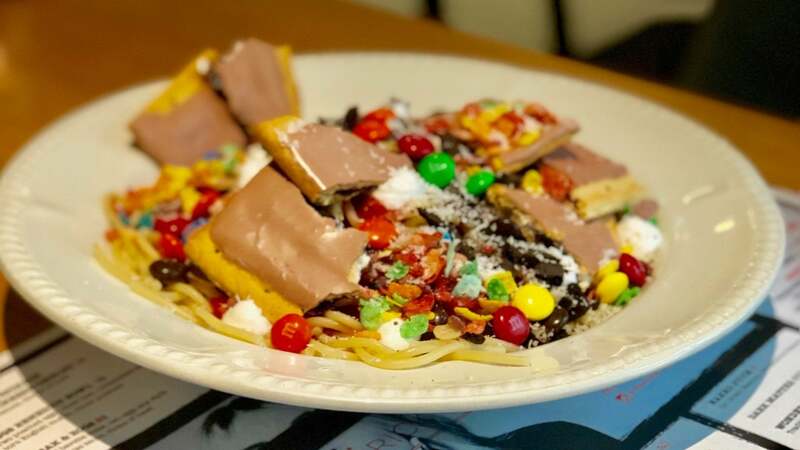 I think a tamer version of this with just coconut shaving and small pieces of dark chocolate combined with the spaghetti would be super yummy. Binging With Babish tried it in 2016. I think it's even in his cookbook. Seriously. They just broke up a poptart and dumped it on there? That doesn't fit with the pasta at all. Not the flavor, but the texture/size of the pieces. Grind that thing up more so you can eat it with the pasta or leave it off the plate. Maybe a single small part as a centerpiece to the pasta that was to be eaten separately might work, but as shown it looks like they didn't even try to make this anything but a gimmick. Now do a plate of beans. To be fair, just breaking up a pop tart and dumping it on the pasta is pretty true to the movie. I just hope they aren't mixing it with their hands. Sure, but at that point they would do better to just bring out the ingredients in separate containers with the pasta and let the person buying it mix their own. I expect a restaurant, even one indulging in a silly gimmick, to put some effort into making the thing edible or even just vaguely presentable as an actual dish. There are plenty of places where you can get pancakes topped pretty much like Buddy does the spaghetti. And by "plenty of places" we understand that you mean IHOP. That's the first place that I drank coffee, when I was a senior in high school, and in retrospect my subsequent energy surge may have had as much to do with the chocolate-chip pancakes. Now I'm trying to imagine what a dish called Throne of Lies would look like. A couple of years ago we had a Christmas gathering of friends and people wanted to watch holiday movies after dinner. We also decided we wanted to play drinking games along with the movies. Everyone was supposed to come up with a rule. I had never seen Elf, but was encouraged to just make something up. I chose "Drink on Pointy Shoes"
That was a... rowdy movie viewing. My friends who had seen it really should have vetoed that rule. Gracious. Just take my foot at the door, why don’t you. Let me tell you about the drinking game we play during the stop-motion Rudolph the Red-Nosed Reindeer. Everybody gets one challenge flag (a fun-sized candy wrapped in a red cocktail napkin, secured with a twist tie or rubber band) to throw if they disagree with the drink / don't drink call. Somebody will throw one of these on a googly-eye call, I guarantee it. Disguting as this sounds, I admit to have actually eaten BP dessert pizza, more than once, and therefore have no right to a seat on this Gustation Bandwagon. I'm going to start collecting all the chewed wads of bubblegum I find stuck to stair railings and the undersides of park benches, re-package them, and sell them under the product name "Buddy the Elf's ABC Gum." A small amount of real maple syrup drizzled over the sauce would probably be quite tasty. I've seriously considered trying it on several occasions. Other than that, no thanks. Hmm, I wonder at what point it stops being pizza and becomes pie? It has been 15 years since Buddy The Elf smiled and twirled and sang his way to becoming a modern Christmas classic. A nearby theatre company is presenting Elf: The Musical as its Christmas show. I mentioned as much to Mrs. Biscuit, as she loved the movie. Unfortunately, due to background noise and a less-than-scrupulous distinction between vowel sounds on my part, she wondered why I reckoned she* would be interested in ALF: The Musical. I only watched Elf when The Littlest Hobo hit the right age for it a few years ago. I was most astonished by the fact that it was Zooey Deschanel playing the exact opposite of the type she'd been cast to, while Will Farrell played an almost literal Manic Pixie Dream Boy. That was the crack in my façade, and I watched the whole film through with her after that and found myself unable to breathe because after the "best cup of coffee in the world" jokes I immediately imagined Buddy coming on stage in the middle of the Sweeny Todd number "Best Pies In London" to congratulate them. I would totally go see Alf: The Musical.